This poor, stunted little specimen on Albany’s West Seventh Avenue has been dying for a long time. Every year another batch of branches withers away, becomes brittle and falls off in the next strong breeze. 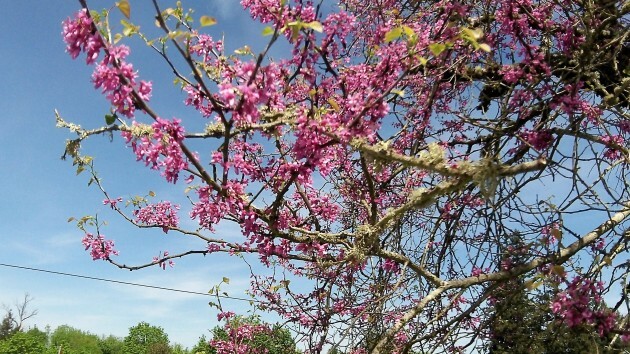 And yet, every spring the remaining branches and twigs still come up with their dainty pink blossoms and, a short time later, a sparse mantle of leaves. It is not, I can say with certainty, any kind of flowering fruit tree. Through nearly two decades that I know of, this thing has never borne a single fruit, at least not one you could recognize as such. It does attract hummingbirds, though. So I guess those little pink flowers are good for something. It would be nice if trees and plants generally came with labels, the way they do, for example, on the courthouse lawn or in botanical gardens. I realize this would not be necessary if I had paid attention when we covered the world of plants in grammar school half a century ago. Here’s a different view, as requested below. And here’s one of the poor old tree itself, if it helps. Please, Mr. Hering, give us a chance for at least an educated guess. 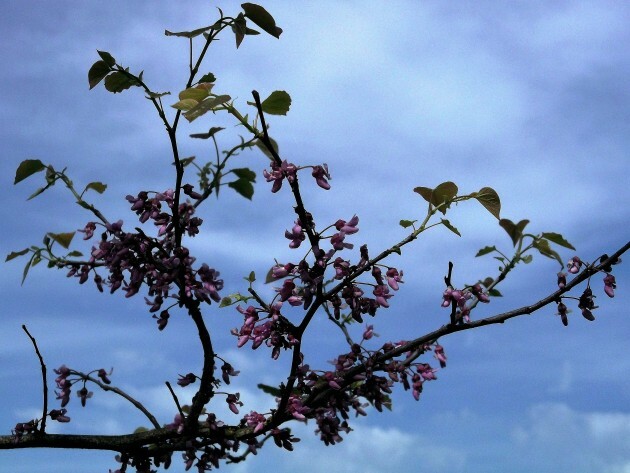 Send the photographer back for a close-up of a blossom, a mature stem and a leaf. and that seems more like a cherry but . . but …. I used to be amused at the dendrology students wondering around the OSU campus staring up at the trees. Now I wish I had joined the herd of mostly forestry students. I have lived here almost all of my life span and am embarrassed by my small knowledge of natural history. 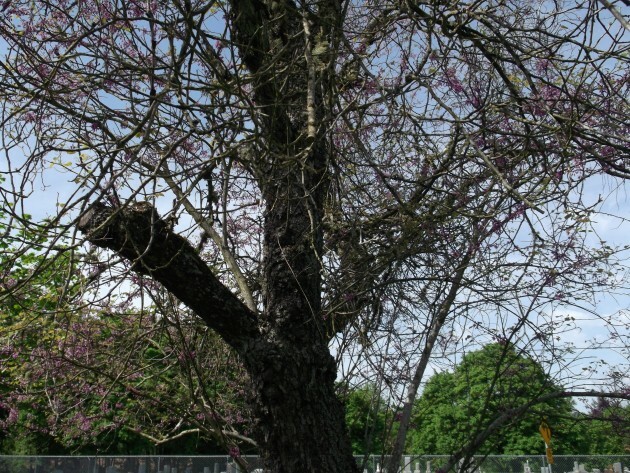 The pictures you posted are low resolution, but it appears to be a Cercis canadensis or related specie. They are not native to Oregon. HH, your point is well taken! All around us are opportunities to learn. If we just take a little bit of time and effort. Aside from tree species, we have breeds of dogs, sounds of specific instruments and styles of beards. The latter being very popular in these times. The options are limitless really. Just the other day, I discovered that a large leafed, bushy plant was an artichoke.